The Annual Cycle at Lava Lake Land & Livestock — by Todd Macfarlane | RANGEfire! Lava Lake Land & Livestock, headquartered near Carey, Idaho, is a unique sheep ranching operation that has had little previous exposure in grass-fed production circles. A combination of factors, including size, scale, duration, and “story,” as well as production and marketing methods, differentiates and distinguishes Lava Lake from virtually all other sheep production operations in the United States. Investment Icon Warren Buffet has long said (and Allan Nation has quoted) that “The key to wealth is allocation of capital.” As an investment banker, Brian Bean seems to have a solid grasp of this principle. Consequently, at a time when aging sheep ranchers were retiring and leaving the industry in ever increasing numbers, and younger generation ranchers were often switching to cattle, Brian and Kathleen Bean became Idaho sheep ranchers. At first blush, Beans may seem like unlikely candidates. They work primarily in the San Francisco Bay area, where they live most of the year. Brian is a successful investment banker, who believes we live in a “Pollanesque” world, agriculturally, and is specifically interested in helping to finance sustainable agriculture projects. The couple also has a specific interest in environmental conservation and activism, as evidenced by Kathleen’s work as development director for the Nature Conservancy. They have two teen-age daughters, who seem to be embracing the same interests and ideals. Back in the late nineties, with ample financial resources in hand from other investments and business ventures, Beans began looking for a ranch in the Mountain West. Although they started out looking in Wyoming, their search soon led them to Idaho. While most other similarly situated buyers typically choose to buy “trophy” ranches in places like the affluent Wood River Valley, in and around Ketchum, Beans ultimately decided to take a more production-oriented approach. Their first acquisition, in 1999, was the Lava Lake Ranch, an old sheep outfit that had been converted to cattle, comprising approximately 7000 acres of private land, which Beans put under a conservation easement as part of the deal. The ranch is headquartered in Blaine County, at the base of the Pioneer Mountains, just outside the small town of Carey, Idaho, and adjacent to Craters of the Moon National Monument. As the crow flies, ranch headquarters is less than an hour from the Wood River Valley, Ketchum, and the Sun Valley resort area. And parts of the high country sheep summer range look right down on those areas. Like many affluent modern ranch real estate investors, Beans didn’t necessarily start out with major production aspirations. Their initial approach was almost entirely from an environmental preservation perspective, with the intent of fully utilizing conservation easements to protect the land from development, and benefit native wildlife, etc. Unlike many other environmental activists, however, Beans experienced a major paradigm shift. Among other things, they realized that their environmental goals and objectives were not incompatible with continued production and other beneficial uses of the land. They also realized that not only could sheep be used as an effective conservation and range management tool, but that they could also develop a very sustainable and financially viable business model in the sheep business. 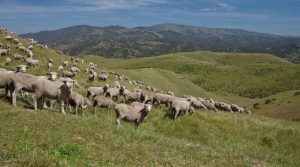 As part of their evolving paradigm, they developed a whole new vision for an unusual, multi-generational and multi-dimensional, environmentally-friendly sheep ranching operation. In light of all the aging and retiring ranchers in the area, their timing probably couldn’t have been better. Taking a broad landscape view, Beans eventually developed a vision for a unique nexus of opportunities for land and resource ownership and management, environmental stewardship and conservation, and sustainable, profitable agricultural production. Based on that unique vision, over the course of the next few years, they acquired and assembled five additional existing ranching operations, totaling approximately 24,000 acres of private land. 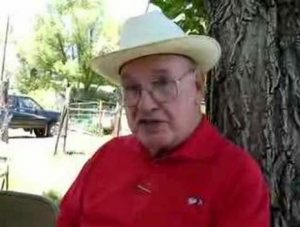 Among others, they bought-out Pete Cenerussa, a well-known Basque sheep rancher now well into his 90’s who served as Idaho’s Secretary of State for many years. At this point, of Beans’ total private land holdings, less than 500 acres is expensive irrigated cropland and/or irrigated pasture. The vast majority of their private property is essentially unimproved native rangeland in and around the foothills of the Pioneer Mountains. The vast majority of the land they utilize for grazing, comprising several hundreds of thousands of additional acres from the desert to the mountains, however, is public land in grazing allotments administered by the United States Forest Service and Bureau of Land Management. Right at a time and in an area where there was so much environmental pressure to completely eliminate livestock grazing on public lands, and many long-time ranchers were becoming very concerned about the future of public lands grazing, Beans realized that by continuing to utilize the public lands livestock grazing permits that went with their private base property, they could become major stakeholders and could have much more say in the management of the adjoining public lands. They also realized that if they were to choose not to graze the public lands, they would lose the ability to be actively involved in hands-on management of those lands. Once Beans made those realizations, and accompanying commitments, they jumped into sheep ranching with both feet. They also embraced and began advocating the position that continued production and multiple, beneficial uses of public lands were not necessarily incompatible with sound stewardship. Today, they run about 5600 head of ewes, and intend to ultimately expand that number to around 6800, which they consider to be about the optimal scale and number for their operation. Although there were upfront costs involved in acquiring the public land grazing permits, acquisition costs for those permits were much less than private property, and the ongoing annual per AUM grazing fees are quite reasonable. But they do require intensive management, including constant herding by hired shepherds, as described below. Although Beans are very actively involved in the vision and operation of the entire spectrum of the Lava Lake sheep operation, from production to marketing, because it has been their desire to develop a sustainable, multi-generational family business model, and because they are busy with other productive occupational ventures as well, in addition to hired shepherds, they also rely on hired on-the-ground management. Based largely on their unique environmental conservation priorities, when hiring a general manager, instead of choosing an experienced sheep operator, they hired Mike Stevens, a very experienced, talented and well-thought-of, land, resource and project manager, who was then managing the nearby Silver Creek Preserve for the Nature Conservancy. Despite his own environmental conservation background and the necessity of learning the sheep business completely from scratch, however, Mike Stevens has played a very instrumental role in developing and implementing the vision for the sheep operation. While Stevens is the overall ranch operation manager, when Beans bought out Pete Cenerussa’s sheep outfit, they hired his experienced sheep manager, Pedro Loyola, to be the sheep foreman for their whole operation. Otherwise, Lava Lake seeks to distinguish itself in a variety of ways. When it comes to financial aspects of the operation, one of the first is a “minimalist” approach, and conspicuous absence of expensive improvements and infrastructure. There is, for example, no elaborate “owner’s home” on any of the ranch properties. From spring to fall, Lava Lake’s sheepherders all live in antique portable sheep camp wagons with canvas-covered tops that resemble prairie schooners. In stark contrast to many of the “trophy ranches” in the nearby Wood River Valley and Sun Valley, Lava Lake runs a very lean production operation. Lava Lake also seeks to direct market as much of its market lamb crop as possible (about 40% at this point), as its own branded product. (Lava Lake direct marketing efforts will be discussed in another installment). When it comes to production, as a matter of principle, Lava Lake principals are fully committed to sustainability. While they are very interested in innovation, they have always sought to balance their innovative ideas with continuity, relying on valuable lessons from their predecessors, which include six different Central Idaho ranch owners, whose ranches were assembled into the current Lava Lake operation. For that reason, they have sought to maintain good relationships with all the previous ranch operators. They have maintained a particularly close and affectionate relationship with Pete Cenerussa. It was Beans’ desire, right from the outset, to find a balance between continuing the very best practices and traditions of their predecessors’ production models, blended with their own innovative ideas. Lava Lake’s basic production methods follow the pattern of nomadic shepherds that have operated around the world since the dawn of time (or at least recorded history) moving with the seasons, and following the natural green forage wherever they can find it. It also means that the operation relies almost entirely on hired shepherds (typically called sheepherders in the West) instead of fences to manage their multiple bands of sheep. Fifty to 100 years ago, those sheepherders would have typically been Basque shepherds from Europe, some of whom, like Pete Cenerussa and his predecessors, would have eventually become Western sheep ranchers themselves. Today, however, most such hired shepherds come from South America, and primarily from Peru, as evidenced by the fact that all of Lava Lake’s 11 herders and camp tender are Peruvians, who work in the United States on three year agricultural work visas. Although sheep foreman Pedro Loyola is also Peruvian, he has been tending flocks in the Pioneer Mountains for well over 15 years, and is now a U.S. citizen. Although Lava Lake is headquartered in Idaho and their ewes spend about eight months every year following the green forage from the low lying deserts of the Snake River Plains in and around Craters of the Moon National Monument in the early spring to the high pastures of the Sawtooth National Forest later in the summer, their ewes don’t spend the whole year in Idaho. Lava Lake trucks its pregnant ewes to the sunny, warm climate of Riverside County California, to winter and lamb on large semi-dormant alfalfa and sudan fields near Blythe, in the California desert along the Colorado River. In addition to the fact that wintering in California is much more pleasant for both their sheep and shepherds than braving much harsher Idaho winters, there are a number of other advantages. Custom winter grazing in California allows Lava Lake to almost completely avoid the use of hay and stored forages. And range lambing in the open fields also allows them to avoid very labor and infrastructure intensive “jug lambing” in sheds. Although calculating carbon footprint is not an exact science, given their environmentally friendly objectives, Lava Lake principals believe their approach does in fact create a smaller carbon footprint than attempting to winter and lamb in Idaho, which would necessitate having a lot more infrastructure, and either having a large scale haying operation, or buying-in outside hay. They are also convinced that in the financial cost/benefit analysis, this approach makes a lot of sense. Moreover, wintering in California allows Lava Lake to almost completely change the schedule of the otherwise applicable annual cycle. Based on the annual schedule adjustment made possible by wintering and lambing in California, Lava Lake’s annual cycle is based on the following pattern: Starting in mid-November, ewes are trucked from Idaho to California to winter and begin a staggered lambing season which begins in mid-November and lasts through February. Ewes and lambs are then trucked back to Idaho to start grazing on BLM grazing allotments in the lower lying deserts of the Craters of the Moon National Monument starting about the first of April. By then the already 2-4 month-old lambs are plenty robust, vigorous, and ready for the rigors of following the fresh new green forage all the way to the top of the mountains, which approach elevations of 12,000 feet above sea level. From spring to fall, Lava Lake’s sheepherders all live in portable sheep camp wagons with canvas-covered tops that resemble prairie schooners. With a saddle horse and a good border collie herding dog or two, each shepherd’s sole responsibility is to tend bands of 7-900 ewes, with about twice that number of lambs. With the help of large white livestock guard dogs, obviously one of the shepherds’ highest priorities is to protect the sheep from predators. The other high priority is to keep the sheep continually moving to the best possible forage available, allowing the lambs to grow at a phenomenal pace. It is critical that the lamb bands be moved continually to give the fast growing lambs continual access to fresh, high quality forage every day. Given the whole operation’s environmentally-friendly orientation, another reason to move often is to reduce impacting any one spot too much or for too long. In terms of sheep genetics, Lava Lake runs mostly Columbia and Columbia/Ramboullet cross ewes, bred primarily to Suffolk rams, for a larger, terminal cross market lamb. They do, however, have one band of Panama ewes, as a carryover from one of their predecessors. To have a staggered lambing season, Lava Lake must also have a staggered breeding season. In keeping with the Basque tradition of putting the rams in just after Summer Solstice on St. John’s Day, as Pete Cenerussa did, Lava Lake begins putting bucks in the earliest lambing bands on June 24th, and they start weaning the biggest lambs from those same earliest lambing bands about the same time. This means they are shipping newly weaned lambs from the end of June through about the first part of September. Obviously, this is earlier than many sheep operations typically wean, but given the early lambing, and excellent forage, the lambs have plenty of growth. According to Lava Lake Manager Mike Stevens, many of their lambs will weigh as much as 140-150 lbs. at weaning, but most are in the 130 range, with some of the youngest lambs as low as 100 lbs. This weaning schedule makes a lot of sense because according to Stevens, based on normal precipitation patterns in the high country, after July there is very little new forage growth, which rapidly growing lambs require for optimal gains. When the lambs are pulled off and weaned, some of the ewe bands are consolidated for breeding and herding the rest of the grazing season in Idaho. The consolidated ewe bands are sheared in September, when they start coming off the mountain summer ranges. They move first onto lower-lying BLM allotments and private ground in the foothills, and then eventually move onto private hay and crop fields in the surrounding area to custom graze on crop residue (primarily alfalfa stubble) on the valley floor until it is time to start loading the trucks to ship the earliest bred bands to California, to start lambing in about mid-November. Then the annual cycle repeats itself.